Extensive technical training from the label printing equipment manufacturers we work with means you'll have a full service team available to serve you well from selection, installation and for years to come. The printing solutions you need. The support you deserve. Advantage Label is committed to providing our customers with individualized label printing systems that are efficient and effective. With our extensive product knowledge on the labels and the labeling equipment, you will receive an in-house label printing system perfect for your company. From semi-automatic labeling applications to high-speed, fully automatic labeling applications, you can turn to one source for the equipment, software, supplies and service and technical support. 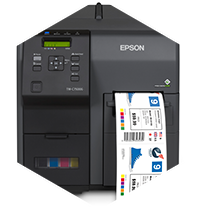 Advantage Label provides sales and support for the best Color Label Printers in the industry. Advantage Label provides sales and support for the best Thermal Label Printers in the industry. Limitless design capabilities with easy-to-use programs – that’s the Advantage Label Advantage. Choosing the proper label and ribbon combination is one of the most critical components to a successful labeling solution.